15 Best Ice Cream Spots around D.C. The sun (and heat) are out in full force this week. What better way to celebrate than treating yourself to a cone or a dish of a cold and creamy treat? Ice cream is crafted in many varieties, so choose your favorite or something new for your next hot day treat. July is also National Ice Cream Month, and Sunday, July 15 will mark National Ice Cream Day this year. The International Dairy Foods Association is encouraging ice cream lovers around the world to celebrate through social media: follow along at @dairyidfa and with #NationalIceCreamMonth. In honor of the occasion, here’s a taste of our favorite ice cream, custard, gelato and novelty treat shops throughout the DMV area. A staple destination since 1979, this location (owned by Mohammed Ali) offers a huge selection of homemade ice cream and options to “blend in” delicious toppings. Our favorite is the chocolate chip cookie ice cream, but you can’t go wrong with any variety. Serving over 63 flavors, this neighborhood favorite offers “atmosphere that evokes the golden age of America’s main streets.” Ray “Pop” Giovanni had been serving popular ice cream in the D.C. area since the 1940s, and even used to serve Eleanor Roosevelt’s favorite ice cream at White House parties. Today, the shop still uses his legacy and recipes. Just south of Frederick, this family-owned location serves up some of the freshest ice cream around in a scenic countryside location. If you prefer to shop local, there is another great reason to stop by: you can buy their milk, cheese, eggs, and farm-raised beef at the same location. It even has a playground for the kids! The Dairy is one of the best spots in the area to stop by for excellent, scientifically tested ice cream. The University of Maryland opened a shop in 1924 to sell dairy products from cows and chickens raised on campus, and shortly afterward, two agricultural professors started to experiment with ice cream recipes. One of them, Wendell S. Arbuckle, became an international authority on ice cream making and even published a textbook on the subject. If you stop by this spot in Stamp Student Union, you know you are getting a product that has withstood the test of time! A neighborhood obsession, this no-frills spot specializes in some of the best, Wisconsin-style frozen custard around. It is made fresh, not held at sub-zero temperatures, and comes in vanilla or freshly mixed with the flavor of the day. You can even share some of their popular banana or pumpkin flavored Puppy Pops (made from plain yogurt, and wheat-free) with your furry friend! This popular spot offers a taste of Jersey style custard (what makes it different than Wisconsin-style custard, no one really knows). You can also stop by for delicious Italian ice, shakes, other desserts, or breakfast. They have a mobile truck and can cater for parties and events. The famous Frozen Dairy Bar, which operated from 1950 until the late 1990s (original location pictured), has now evolved into the new FBD Eatery Restaurant–but their original custard recipe remains unchanged. Check out their flavor calendar, and choose between one to four scoops–or make your own sundae or milkshake. This popular chain is opening locations at a rapid pace throughout the DMV. 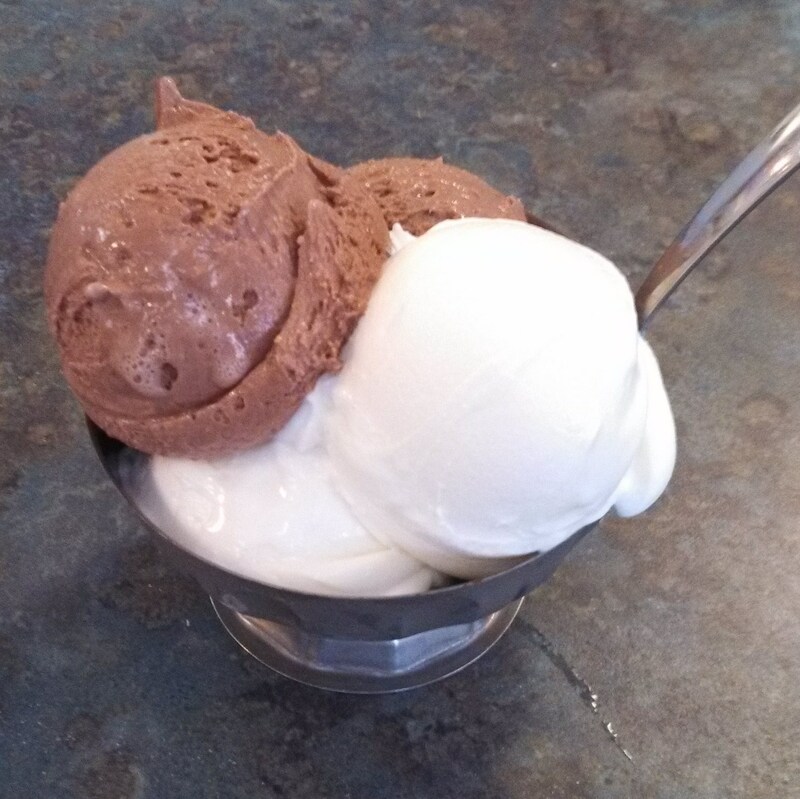 Dolcezza specializes in serving “old world” gelato with locally sourced ingredients. You can even check out their farmer partners here. In addition to the more traditional locations, they operate at the Dupont FRESHFarm market on weekends, at their Mom & Pop location in Mosaic District (also serving food, beer, wine, and local coffee and pastries), as well as their newest ultra-sheek location in the Hirschorn Museum. This delicious Alexandria spot has been serving up some of the best gelato around for over 12 years. The business was founded by Gianluigi Dellaccio, who was appointed Italy’s “Ambassador of Homemade Gelato” in 2018. The natural flavors change daily, but a couple of years back, a saffron pistachio flavor made it near the top of the world’s best gelato. Boasting a number of convenient locations, with a focus on the “classics done right,” Pitango Gelato does not disappoint. The sorbet flavors are all vegan and are derived from fresh organic fruit that is in-season and locally-sourced whenever possible. Started in 2014 by corporate lawyer-turned-entrepreneur Victoria Lai, this popular spot wins local D.C. favorite awards year after year. The shop specializes in some of the most creative flavors around, including several with a boozy twist, like banana bourbon caramel and gin and tonic sorbet. With two local locations and a rotating calendar of flavors, this shop is a must. They combine local grass-fed cream with other local ingredients, and mix and freeze them in front of you in small batches with liquid nitrogen. What could be cooler than feeling like your ice cream is a science experience just for you? Trickling Springs Creamery | Union Market, NE D.C. This no-frills spot packs a big taste. Housed within Union Market since its opening in 2012, hails from a nearby Chambersburg, PA creamery founded in 2001. The creamery uses strict standards for the cleanest milk (“farmers were required to maintain grass-fed, heritage breed cows, produce very clean milk (as measured by SCC & SPC counts), and use no synthetic hormones”) and then minimally processes the milk for a richer taste. We love their artisanal soft-serve, which comes in either 4% or 8% butterfat. Owner Susan Soorenko studied under renowned ice cream makers in New York and gelato specialists in Italy to learn how to make the purest, highest-quality ice cream. They serve ultra-premium ice cream, which is a higher standard of creaminess (at least 16% milkfat) than normal and premium ice cream. Their ice cream is also custard based, using egg yolk as emulsifiers. You can’t beat this creamy treat! Photos (in order of appearance) are courtesy of Adobe Stock (main post photo), Thomas Sweet’s website and Pinterest; (Pop’s Old Fashioned Ice Cream) M. Enriquez for Visit Alexandria; (Rocky Point Creamery) Pinterest; (Maryland Dairy) UMD Right Now; C. Davidson for Visit Alexandria and The Dairy Godmother; Carmen’s website; FDB Eatery’s website; Dolcezza’s website; (Dolci Gelati) via Visit Alexandria; Pitango Gelato’s Facebook; (Casa Rosada) via Visit Alexandria; Ice Cream Jubilee’s website; (NiceCream) via of ARL Now. This entry was posted under Neighborhood Guides and tagged Custard, D.C., Gelato, Ice Cream, NEIGHBORHOOD GUIDES, Summer.